HUNTERSVILLE, North Carolina (March 26, 2019) – “Bein’ Green” (also known as “It’s Not Easy Bein’ Green”) was a song originally performed by Jim Henson as Kermit the Frog on both Sesame Street and The Muppet Show. It was later covered by Frank Sinatra and other performers. In the Muppet version, Kermit begins by saying he feels like green “blends in with so many ordinary things” and wishing to be some other color. But by the end of the song, Kermit says that the color green isn’t so bad and decides to embrace it. For Kyle Busch and his green-and-white-striped No. 18 Interstate Batteries Toyota for Joe Gibbs Racing (JGR), it’s been very easy to be green of late. In fact, two weekends ago, Busch’s Interstate Batteries green looked awfully good throughout the 200-lap race at Auto Club Speedway in Fontana, California, on his way to a dominating win that also happened to be his 52nd career Monster Energy NASCAR Cup Series victory and his 200th overall NASCAR national series win. As Busch and the Cup Series head to Texas Motor Speedway for Sunday’s O’Reilly Auto Parts 500, just 35 miles from Interstate’s Dallas-based headquarters, his green Interstate Batteries scheme happens to be that of the defending winner of the event as he drove to his third career Texas Cup Series victory last April. Back in 1991, then-Washington Redskins head coach Joe Gibbs found himself in those very same Dallas headquarters, visiting with Interstate Batteries chairman Norm Miller. Gibbs was there to make his pitch to have Miller’s company sponsor the three-time Super Bowl-winning head coach’s first foray into the Cup Series. The only problem was that Gibbs had no race shop, no employees, not even a driver to drive his cars. What he was selling to Miller that day was nothing more than a dream. During his entire business career, Miller was never shy about taking chances. And while Interstate Batteries had sponsored a few races with a little-known team with Stanley Smith as the driver, Miller and Interstate Batteries agreed to sponsor Gibbs’ team following that meeting, and JGR was formed. Fast forward to 2019 and the JGR organization that started from humble beginnings before the commitment of Interstate Batteries is widely recognized as one of the premiere teams in all of NASCAR. Busch, the 2015 Cup Series champion, first drove the No. 18 Interstate Batteries Toyota for JGR to victory lane at Texas in April 2013, giving the brand its first win at its home track. The win ended a streak of 19 Cup Series races in which Interstate had competed at Texas without a coveted victory. Busch followed it up with a win in the April 2016 Cup Series race at Texas, and with his third win coming in the aforementioned race last April, he’ll now aim for his fourth Texas win during Sunday’s 500-mile race. On top of his two Cup Series wins there, Busch is no stranger to victory lane at Texas in other NASCAR series. He reeled off an incredible string of five consecutive NASCSAR Xfinity Series wins there from April 2008 to April 2010, then scored three more wins in April 2013, November 2014, and April 2016. Add his three NASCAR Gander Outdoors Truck Series wins in November 2009, 2010, and 2014 and Busch hits town this weekend with 14 NASCAR national series wins at the 1.5-mile oval and is poised for more as he is entered in all three national series races during the weekend. Busch will look to continue his and the No. 18 team’s impressive start to the season as he is the only driver to notch top-10 finishes in all six races contested thus far. In addition to the top-10 streak, Busch currently has two wins, five top finishes and sits atop the point standings as the series heads to Interstate Batteries’ backyard. So as the hot start to the season has continued, Busch and the Interstate Batteries team are charging toward yet another win in the Lone Star State as Busch has proven that the colors of the official battery and founding sponsor of JGR have made it very easy to be green. What are your thoughts heading into Texas this weekend? How special has the partnership between JGR and Interstate Batteries been for you? Are you expecting teams to be more competitive at Texas, and not just Joe Gibbs Racing and Team Penske that have led the way so far this season? What has Norm Miller meant to Joe Gibbs Racing over the years? The O’Reilly Auto Parts 500 will mark Kyle Busch’s 505th career Monster Energy NASCAR Cup Series start and his 27th NASCAR Cup Series start at Texas Motor Speedway in Fort Worth..
Busch has career totals of 53 wins, 31 poles, 188 top-five finishes, 275 top-10s and 16,211 laps led in 503 career Cup Series races. His most recent Cup Series win came two races ago at Auto Club Speedway in Fontana, California, his second consecutive Cup Series victory. Busch’s most recent pole, the 30th of his career, came in October at Martinsville (Va.) Speedway. Busch has three wins, 12 top-five finishes and 13 top-10s and has led a total of 864 laps in 26 career Cup Series starts at Texas. 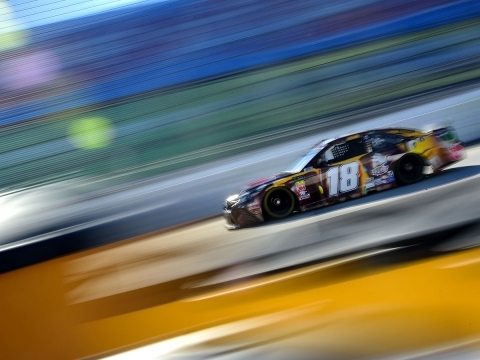 Busch’s average Texas finish is 11.8. 53 Career Cup Series Wins: With his Cup Series win at Auto Club two weekends ago, the 53rd points-paying win of his career, Busch sits 11th all-time in Cup Series wins and is one win away from tying NASCAR Hall of Famer Lee Petty’s 54 wins in NASCAR’s top series. With his 40th Cup Series victory at Bristol (Tenn.) Motor Speedway in August 2017, Busch became the fourth-youngest driver to reach 40 Cup Series wins at 32 years, 109 days, behind only Richard Petty, Jeff Gordon and Herb Thomas. 15 and 5 Club: Busch’s wins at ISM Raceway near Phoenix and Auto Club the earlier this season means he has won at least one Cup Series race for 15 consecutive seasons. The wins also mean Busch has won back-to-back races for the fifth consecutive season. Six-for-Six: Busch has notched six top-10 finishes in the six races contested so far this season in NASCAR’s top series. Five of those were top-fives, the lone “blemish” being his sixth-place finish the second week of the season at Atlanta Motor Speedway.